↑ Journal of the American Chemical Society, 60 (2) , pp. 309-319 (1938). ↑ For Teller's academic career through 1941, see either Goodchild 2005, chapters 3 to 5, or Blumberg and Panos 1990, chapters 3 to 5; also ANB George Gamow. (The ANB has not been updated since Teller's death.) For his own account, see Teller, Memoirs, chapters 6 to 14. ↑ Rhodes 1995; Herken 2002. ↑ Hughes, Colin (2005). "The Real Edward Teller?". Logosonline. Retrieved 2007-10-31. ↑ Shurkin, Joel N (September 10, 2003). 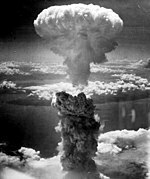 "Edward Teller, 'Father of the Hydrogen Bomb,' is dead at 95". Stanford Report (Stanford News Service). Retrieved 2007-11-27. 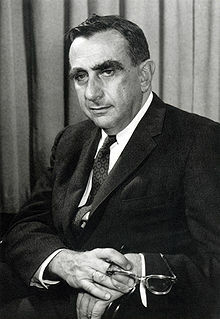 ↑ Edward Teller, RIP". The New Atlantis. Fall 2003. ↑ "Hertz Foundation Makes US$1 Million Endowment in Honor of Edward Teller" (Press release). UC Davis News Service. 1999-06-14. Retrieved 2007-11-24. ↑ Teller, Edward (April 28, 1954). "In the Matter of J. Robert Oppenheimer: Transcript of Hearing Before Personnel Security Board". pbs.org. United States Government Printing Office. Retrieved 2007-11-24. ↑ Shapin, Steven (2002-04-25). "Megaton Man". London Review of Books. Retrieved 2007-11-24. Review of Edward Teller's Memoirs. ↑ McMillan, Priscilla (2005). The Ruin of J. Robert Oppenheimer and The Birth of the Arms Race. Viking. আইএসবিএন ০-৬৭০-০৩৪২২-৩. ↑ Rhodes 1995, p. 255. ↑ Teller, Memoirs, ch. 22. ↑ "Rockefeller Report Calls for Meeting It With Better Military Setup, Sustained Will". Time magazine. January 13, 1958. ↑ "Time Person of the year, 1960: U.S. Scientists". Time magazine. January 2, 1961. Retrieved 2007-11-28. ↑ "The Ames Astrogram: Teller visits Ames" (PDF). NASA. November 27, 2000. p. 6. Retrieved 2007-11-28. ↑ "Presidential Medal of Freedom Recipient Dr. Edward Teller". Presidential Medal of Freedom. ↑ This quote has been primarily attributed to Rabi in many news sources (see, e.g., McKie, Robin, Megaton megalomaniac, The Observer, May 2, 2004), but it has also in a few reputable sources been attributed to Hans Bethe (i.e. in the notes to the Epilogue in Herken 2002, note 40). Carl Sagan writes at length about Teller's career in chapter 16 of his book The Demon-Haunted World: Science as a Candle in the Dark (Headline, 1996), p. 268-274. Edward Teller speaks at Lasers '87 while conference chairman, F. J. Duarte, looks on.